Travelling to Rome in January for the first time, arriving Sunday night. I will have 4 days to see Rome. We will be staying on Via Palestro and using the Omnia Vatican & Rome Card. Trying to keep to a low budget, not an extravagant eater (Mom & Pop shops for reasonable prices are great!). I heard that Trastevere was an area with good food for not so high prices, is this right and how far from Via Palestro is this? I planned on doing St. Peters + the dome hike, Sistine Chapel, Borghese & St Johns. Is this possible to do in 1 day, and would these take a whole day? Should I make reservations even with the Omina Vatican Card that gives fast track entry and for which ones? What would the best means of transportation be for this? Are there any not to miss things in this area I dont know about? The colloseo, Pantheon (Is entry here really free? ), Trevi Fountain, Roman Forum; can all of these be done in 1 day? Any not to miss things in this area? Where would be a good night time spot for pictures or sunsets be? Can I do a day trip from Rome to Florence to see the Statue of David? Would this train leave from the Termini (this is the closest Station to me)? Would I have time to see other things in Florence if the day trip is possible. Any advice you have would be greatly appreciated, thank you! Hi Diana, thanks for stopping by! – St. Peters + the dome hike, Sistine Chapel, Borghese & St Johns in one day is not realistic! Plan not less than 2 hours (more in case of queues) for St Peter and the dome, 2 to 4 hours for sixtine chapel and vatican museum (it would be a pity to see only the chapel). Borghese Gallery is in a total different place (Villa Borghese park). If for st John you refer to San Giovanni basilica, it’s in a third area, not too far from Termini station. If you go there don’t miss the “scala santa”, just opposite. – coloseo, Pantheon (yes, it’s now a church, so entrance is free), Trevi Fountain, Roman Forum; can all be done in 1 (long) day. 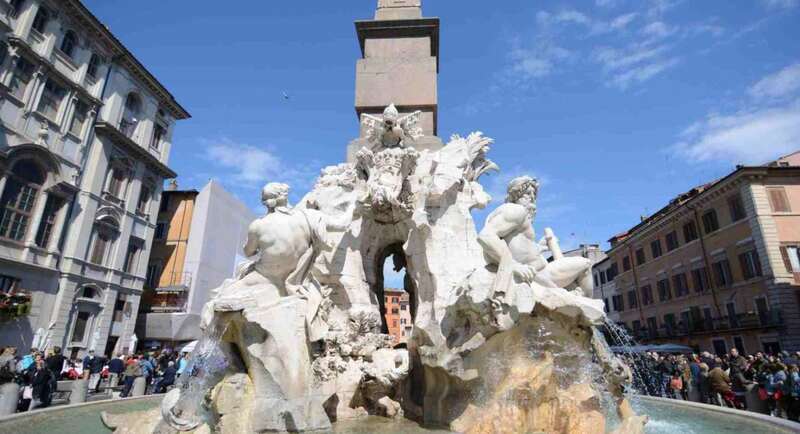 Don’t miss Piazza Navona and Campo dei fiori (lively place for a glass of wine, nice market in the morning). From Campo dei Fiori you cross the bridge over the Tiber river, and you are in Trastevere! – You can get from Rome to Florence with a high speed train (1,5 hours, but not cheap). It stops in the very center of the town, so you can have a full day there, enough to have a good glimpse of the city. Have a look at my post “Florence in a day”. Note that the David statue you can see in Piazza della Signoria (main Florence square) is a copy, the original is in the Accademia Museum.